Express Writers, founded by Julia McCoy, is a full-service content creation agency that specializes in creating written and designed content for great content marketing. From web pages and bios, to ebooks and comprehensive authority content, and industry specialized writing, our team can expertly handle all parts of content creation. 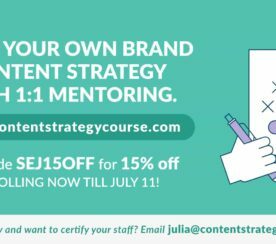 Check out Express Writer’s Content Strategy Certification Course, and get a 15 percent discount until July 11!